At some point in the next patch, the Battle for Azeroth is going to change to the Battle for Azeroth. The faction war/race for claiming the lifeblood of the planet will flip into reviving the planet as we fight for its very existence. 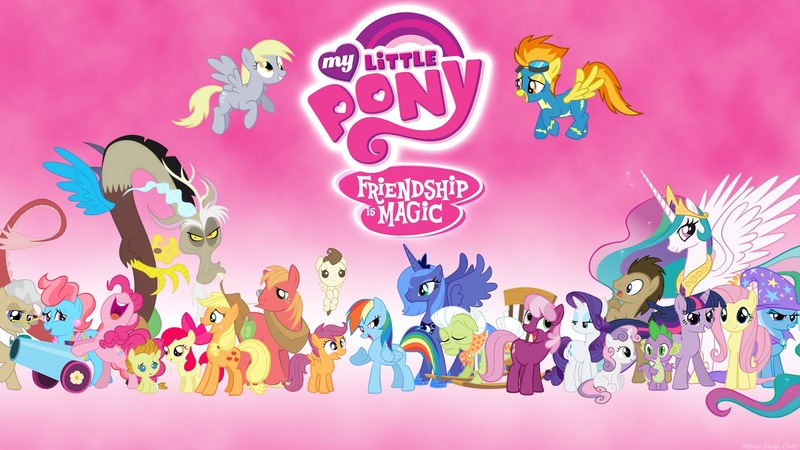 We'll use the power of friendship and cooperation, to hug the planet back to life. 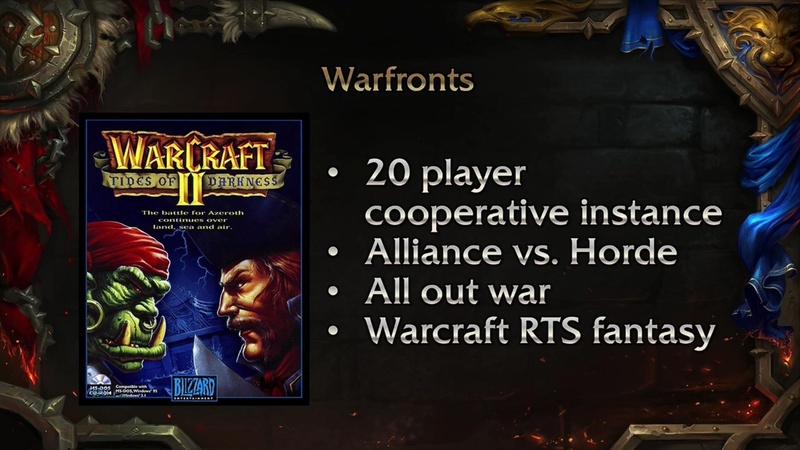 I wanted to really like the warfronts. I had grand visions from Blizzcon 2017 slides. 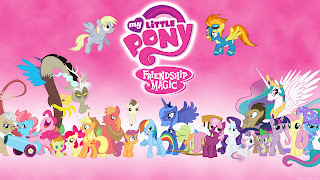 I imagined them like a PVE BG. Dynamic, interactive and always playable. Instead, I got frustration where I couldn't queue for them for a month (as Alliance) with no real way of knowing how long until I would participate. When are ALL dungeons going to get a blue circle on the map? I shouldn't need to use an addon, or WoWhead to find an old dungeon when the same technology is available for later expac dungeons. Speaking of dungeons, WOD Timewalking is now a thing. Since there were only 8 dungeons will all of them become part of the rotation? (all the rest only include 6). What Mists of Pandaria raid would you like to see included as a TW raid? Mogu'shan Vaults? Throne of Thunder? Siege of Orgrimmar? Need to finally give Uldir normal try. I've done practice mode first three bosses (aka lfr) twice now and feel good. No laser beams on the first boss. Have been trying to level my crafting up as I go. Unfortunately, the recipe for recipe BOP mail boots (for example) requires 30 expulsom and 15 hydrocore. This will require a decent number of drops from dungeons. I think I have 3 hydrocore at the moment in my bags. Pugs don't like me. BM Hunter, 347 ilevel and no one wanted me in their Mythic+2. Maybe Monday night is a dumb night for dps. Pirate boat, that doesn't float but has a glow like Jaina's boat should explain everything. It rose from the deeps (hence the octopus on the front) and been enchanted to keep it up. I pointed out 2 years ago, there are plenty of mounts that also should skim above the surface of the water, but don't. Why would Blizzard put one on the store for RL money all of the sudden? Nope, not going to happen, unless they want EA-itis. 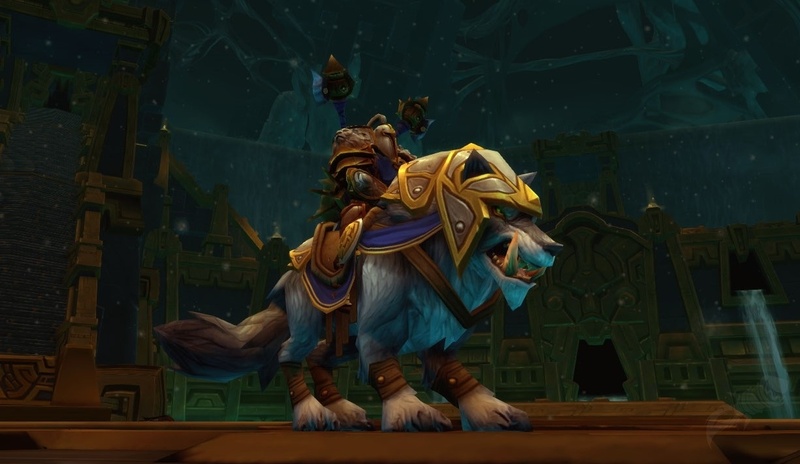 Personally, I was surprised they made the Blizzcon 2017 mount last year 2-rider. Now quit your whining, go get the rep to buy the water skeeter. Put that level 100 alt that you don't play anymore out there and do the fishing dailies. I tried to tame Guarm in ToV the other night (solo). Sadly the two meta bosses need to be kept 35 apart. Hard to do that when my pet keeps aggroing everything. Frost trap? nope. Tar trap? nope. Simply kiting? Nope. Aggro off? Nope. Sigh. Maybe go try to tame the quest zone model. I'd participate in more island invasions if I didn't need to go back to Boralus each time. Scenarios had their own queue back in Cata(?). I want that. War resources seem so rare to get. I am always running less than 100. The Tortollan appear to be the only emissary that reward them. Maybe raids? Heroic dungeons? Heritage armor, please make it not chop off my hair. The BELF model has the female hair cropped. I will likely xmog my helm if the armor removes her ponytail. The dwarf model better not shave his beard. The sample model looks good so far, but he looks (personally) ridiculous when his beard is gone. Bee Xmog is coming along nicely. When I saw this (here), I got excited! Then I realized it's probably for the taxi-stand in Stormguard. Still waiting to be tempted by Blizzcon 2018 VT. Even better would be the chance to attend in person. Nor.Cal to Anaheim is about 400 miles away, but that's nothing compared to what others of you'll be traveling. 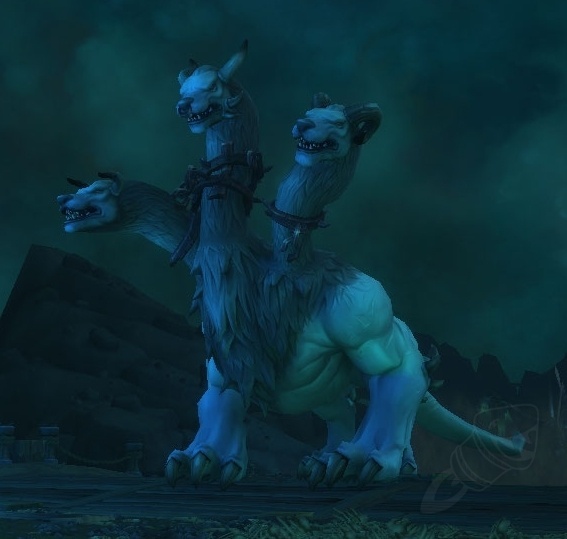 You could try Island Expedition with the explicit purpose of farming for pet/mount/toy. I set up a PUG to do that, and 2 run of IE and 2 pets. Basically you want to kill as many named elite as possible and wait for the second half of IE when the island is visited by another group. Go and kill those group and your loot table will be filled. I am hearing that IE are a great way to level up alts. I am considering to try leveling up my paladin (via ret) via this method. Otherwise, Azeroth AutoPilot was very useful on my hunter to cleanup the last dozen or so remaining quests.